Background: Contrast sensitivity measurement in UK clinical practice is most commonly performed with the Pelli–Robson chart. Aims: To compare the repeatability of two new contrast sensitivity charts and to measure their agreement with the Pelli–Robson charts. Method: Contrast sensitivity was measured monocularly using two versions of the Mars letter contrast sensitivity chart, two presentations on the Test Chart 2000 and two versions of the Pelli–Robson chart. Bland–Altman techniques were used to assess repeatability and agreement. Results: 53 subjects were recruited with visual acuity from 6/4 to 6/72. The coefficient of repeatability was 0.182 for the Pelli–Robson chart, 0.121 for the Mars chart and 0.238 for Test Chart 2000. Limits of agreement with the Pelli–Robson chart were −0.29 to +0.15 log units for the Mars letter contrast sensitivity chart and −0.32 to +0.78 log units for the Test Chart 2000. For patients with poor contrast sensitivity, the limits of agreement between the Test Chart 2000 and the Pelli–Robson chart improved from −0.33 to +0.15 log units. Conclusion: In a population of hospital ophthalmology patients, the coefficient of repeatability is better for the Mars chart and worse for the Test Chart 2000 when compared with the Pelli–Robson chart. The electronic test chart does not agree well with the Pelli–Robson chart, although this might simply be due to the performance of liquid crystal display screens at low contrast levels. The Mars letter contrast sensitivity chart shows good validity and reasonable agreement with the Pelli–Robson chart. The ability to detect objects at low contrast (contrast sensitivity) is a fundamental aspect of visual performance and is closely related to the ability to perform tasks such as driving,1,2 reading3–6 and navigation.6–9 Evidence also suggests that contrast sensitivity may help in detecting and monitoring ocular diseases such as glaucoma,10 cataract11 and optic neuritis.12 Contrast sensivity can also be used in evaluating outcomes of refractive surgery.13 Measuring contrast sensitivity provides additional information on the quality of vision and as such is recommended for use in low vision clinics.14 However, contrast sensitivity is not widely measured in UK optometric practice.15 We speculate that one reason for this may be the size of the Pelli–Robson chart. The Pelli–Robson chart is wall mounted (measuring 60×85 cm) and viewed at 1 m, with the subject wearing an addition of +0.75 DS over the distance refractive correction. The chart uses the 10 Sloan lettersi with constant size. The letters are arranged in 16 triplets over 8 lines, where each line consists of 2 sets of triplets all of constant size.,16 In our experience, it can be difficult to ensure even illumination across the entire chart. Further, only two versions of the chart are available, meaning that its use is limited when repeated measures of contrast sensitivity are required (such as in longitudinal studies) or when measurement of each eye individually and a binocular reading are required. Two new contrast sensitivity charts have recently been made commercially available. A recent review of the Mars chart by Dougherty et al18 showed good agreement with the Pelli–Robson chart (95% limits of agreement ±0.21 log units), as well as good repeatability (95% limits of agreement ±0.20 log units). Their results showed that subjects with poorer contrast sensitivity scored better on the Mars charts than on the Pelli–Robson chart. It was also found that subjects with low vision had a slightly better repeatability with the Mars chart than with the Pelli–Robson chart, although subjects with normal vision had a better repeatability with the Pelli–Robson chart. Subtle differences in the contrast levels on the different versions of the Mars charts were found. It seemed that some individual letters on certain charts (chart 3) had a different contrast value than what was actually stated. However, when adjustments to these differences were made, the Mars test resulted in a greater repeatability.18 Another study by Haymes et al19 investigating the reliability, validity and responsiveness of the Mars letter chart compared with the Pelli–Robson chart indicated that the Mars test has test–retest reliability equal to or better than the Pelli–Robson test. However, they also found systematic differences between the Mars chart and the Pelli–Robson chart, indicating the possibility that normative values were likely to be different for each test. Second, the Test Chart 2000 has been developed by Professor David Thomson of City University, London, UK. This is a computerised comprehensive test chart system that presents optotypes on a computer monitor. The Test Chart 2000 contrast sensitivity test is similar to the Pelli–Robson test. For example, the chart is viewed at 1 m with the subject wearing an addition of +0.75DS. Each triplet of letters also has the same contrast as the Pelli–Robson chart, although only one triplet is presented per line. There are no published data on the validity or reliability of testing contrast sensitivity with this system. Patients were recruited from the refraction and low vision clinics at the City Road site of Moorfields Eye Hospital, London, UK. All patients were required to have a visual acuity (VA) of 3/60 or better, to be over the age of 18 years and to speak English. Snellen acuity was recorded as this information was obtained from the refraction and low vision clinics. The study was reviewed by the Moorfields and Whittington local research ethics committee and informed consent was obtained from all participants before data collection. Participants were asked to read six letter charts: two different Pelli–Robson charts, two different Mars charts and two different presentations on the Test Chart 2000. Charts were presented in a randomised order determined by a computer spreadsheet. All charts were viewed monocularly with the right eye (left eye occluded with palm of hand), using the optimum refractive correction as determined in their low vision or refraction appointment with appropriate addition for the screen distance (+0.75 DS for the Test Chart 2000 and Pelli–Robson charts; +2.00 DS for the Mars chart). Testing took place in a quiet clinical room. Illumination was provided for the room by overhead fluorescent tubes. No local lighting was used in order to ensure a minimum shadow in the room. The Pelli–Robson test (Haag–Streit, Harlow, UK) was wall-mounted and patients were tested at 1 m. Pelli–Robson scoring sheets were used to determine the contrast sensitivity. The “letter-by-letter” scoring system was used, whereby each letter correctly identified was scored as 0.05 log units (except for the first triplet, where contrast is 100%).21 Testing ended when the patient missed two of three letters in a triplet. Mean chart luminance, measured using a photocolourimeter (Minolta CS100, Konica Minolta, Osaka, Japan), was 87 cd/m2. The Mars Letter Contrast Sensitivity chart (Mars Perceptrix, Chappaqua, New York, USA) was held by the patient at 40 cm. Chart 3 was not used as Dougherty, et al18 showed that some individual letters on this version of the chart had a different contrast value from that stated. As advised in the Mars chart manual, if a patient responded with a letter other than the 10 letters on the chart, they were advised of the restricted letter set and asked for another response. Testing ended when the patient made two consecutive letter-reading errors. The scoring sheet supplied in the Mars chart manual was used to record the contrast sensitivity.17 The mean chart luminance was 113 cd/m2. The Test Chart 2000 software (Thomson Software Solutions, Hatfield, Hertfordshire, UK) was installed on a PC (Precision 340, Dell, Texas, USA) running a supplementary liquid crystal display (LCD) monitor (Acer, Taiwan) through a standard VGA connection. Participants sat 1 m away from the monitor. Scoring was identical to that on the Pelli–Robson chart. The screen was γ corrected using the function provided with the Test Chart 2000 software. The chart was left on for several minutes before testing to ensure that luminance had reached peak level. The mean screen luminance was 304 cd/m2. The coefficient of repeatability for each chart was calculated using the method recommended by Bland and Altman.22 The coefficient of repeatability describes the amount by which two measurements made on the same individual by the same instrument vary. The coefficient of repeatability is defined as being twice the SD of the differences between the two measurements using the same chart on the same individual. For the new tests, limits of agreement with the Pelli–Robson chart were also calculated using Bland and Altman techniques. For this analysis, the mean and SD of the difference between the first reading on the new test and the mean reading on the Pelli–Robson test were calculated. Limits of agreement were expressed as mean (SD 2) of the difference.22 JMP software V.5.1 was used for all analyses. Figure 1 shows the repeatability for each of the tests. Analysis of these graphs shows no relationship between the difference between the values and the mean, so no log transformation of the data was performed. For the Pelli–Robson chart, the coefficient of repeatability was 0.182 log units (fig 1A). The Mars chart had a coefficient of repeatability of 0.121 log units (fig 1B) and the Test Chart 2000 had a coefficient of repeatability of 0.238 log units (fig 1C). Coefficient of repeatability for (A) the Pelli–Robson chart; (B) the Mars letter contrast sensitivity chart; and (C) the Test Chart 2000 (TC). CS, contrast sensitivity. Figure 2 shows the limits of agreement between the first Mars chart result and the mean Pelli–Robson chart. The limits of agreement were −0.29 to +0.15 log units between the first Mars letter contrast sensitivity chart result and the Pelli–Robson chart (fig 2A), and −0.32 to +0.78 log units between the first Test Chart 2000 result and the mean Pelli–Robson result (fig 2B). Limit of agreement between (A) the Mars letter contrast sensitivity chart and the Pelli–Robson chart (PR), and (B) between the Test Chart 2000 (TC) and the PR chart. The limits of agreement between the Test Chart 2000 and the Pelli–Robson were substantially larger than for the Mars chart and Pelli–Robson. Post hoc examination of the data revealed inconsistencies for high contrast sensitivity values measured using the Test Chart 2000. When analysis was repeated for the subjects with contrast sensitivity ⩽1.70, the limits of agreement were −0.33 to +0.15 log units (fig 3). 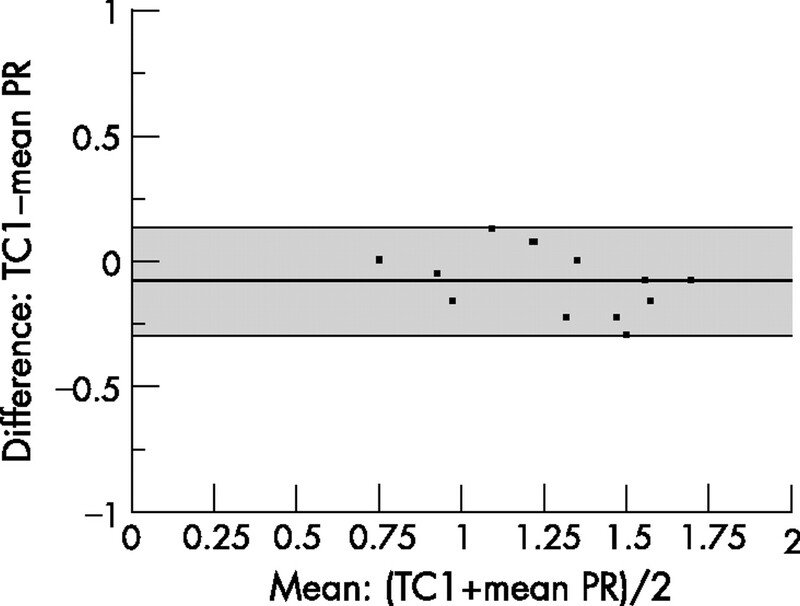 Limit of agreement between the Test Chart 2000 (TC) and the Pelli–Robson chart (PR), for patients with contrast sensitivity of ⩽1.70 log units. 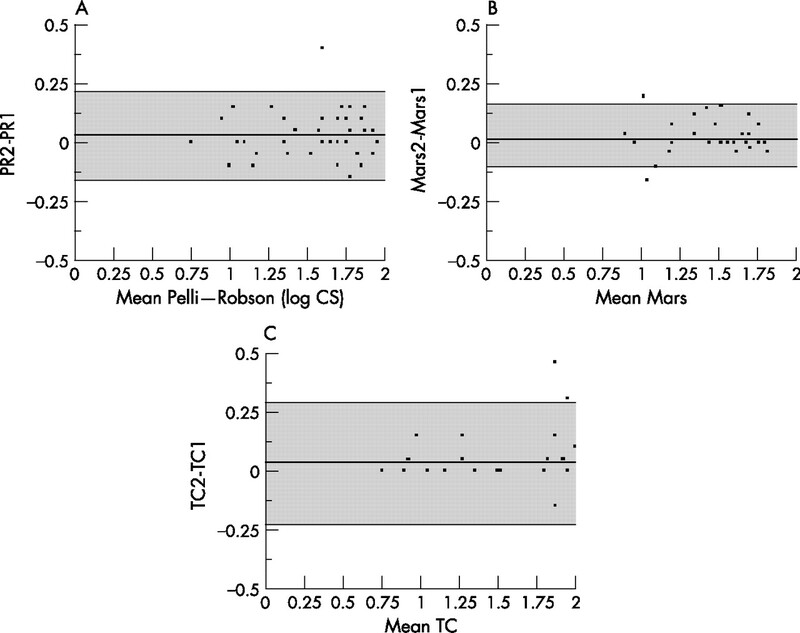 In this study, we found the contrast sensitivity measurement to be slightly more repeatable for the Mars chart, and less repeatable for the Test Chart 2000, when compared with the Pelli–Robson chart. Our results for repeatability of the Pelli–Robson chart are similar to those found by other groups (table 2). Our data show that the Mars letter contrast sensitivity test may be slightly more repeatable than the Pelli–Robson chart. We also found good agreement between the Mars and the Pelli–Robson charts. This is in conflict with recent results for a similar size sample, reported by Haymes et al19 who stated that the Mars chart measured poorer values than the Pelli–Robson chart for people with good contrast sensitivity and vice versa. However, the analysis used by Haymes is susceptible to a regression to the mean problem: as the abscissa in their paper contains only one value (the Pelli–Robson score), a high reading on one chart is statistically likely to be followed by a low reading on the other chart. Bland and Altman22 are explicit that the x axis of these plots must contain the mean value rather than only one value, to overcome this artefact. The Test Chart 2000 was found to be slightly less repeatable than the Pelli–Robson chart. Whether this limit of repeatability would be acceptable for routine practice would be at the discretion of the clinician and the reason for measuring contrast sensitivity. Given that the limits of agreement are more favourable for people with poorer contrast sensitivity, we suspect that the representation of low contrast levels may be suboptimal on a LCD monitor. LCD monitors have been shown to be less suitable for psychophysical measurement of contrast than cathode ray tube displays.27 A further problem with the display we used with the Test Chart 2000 is its high luminance. We suspect that the poorer agreement between the Test Chart 2000 and the Pelli–Robson is due to screen properties rather than the Test Chart 2000 in itself. We would advise people using the Test Chart 2000 system to measure contrast sensitivity to use a CRT monitor if accuracy of measurement is critical (eg, in a clinical trial). The Mars chart was found to be straightforward to use as the patient could remain in the examination chair. Maintaining even illumination across its surface was not difficult. However, patients had to be instructed not to tilt the chart when reading letters near the contrast threshold. The Mars charts are considerably easier to store and to move between clinic bays than the Pelli–Robson chart. The Test Chart 2000 is slightly less easy to add into a standard examination, as the patient must move in order to view the monitor at 1 m. The examining optometrist found the contrast sensitivity values were displayed on the screen alongside the test letters to be of benefit, removing the need for additional scoring sheets. We did not assess subjects’ preference as to which chart they found easiest to use, or that they preferred using. In a busy clinical setting, it may be that having all the tests performed on one instrument (as is possible with the Test Chart 2000) would be easier for the patient. The assessment of contrast sensitivity is an important yet underused test. It is hoped that the availability of these new tests will encourage clinicians to incorporate contrast sensitivity into their examinations. Wood JM. How do visual status and age impact on driving performance as measured on a closed circuit driving track? Ophthal Physiol Opt 1999;19:34. Wood JM. Age and visual impairment decrease driving performance as measured on a closed-road circuit. Hum Factors 2002;44:482–94. Whittaker SG, Lovie-Kitchen J. Visual requirements for reading. Optom Vis Sci 1993;70:54–65. Rubin GS, Legge GE. Psychophysics of reading. VI—The role of contrast in low vision. Vision Res 1989;29:79–91. Leat SJ, Woo GC. The validity of current clinical tests of contrast sensitivity and their ability to predict reading speed in low vision. Eye 1997;11:893–9. West SK, Rubin GS, Broman AT, et al. How does visual impairment affect performance on tasks of everyday life? The SEE project. Salisbury Eye Evaluation. Arch Ophthalmol 2002;120:774–80. Marron JA, Bailey IL. Visual factors and orientation mobility performance. Am J Optom Physiol Opt 1982;59:413–23. Turano KA, Broman AT, Bandeen-Roche K, et al. Association of visual field loss and mobility performance in older adults: Salisbury Eye Evaluation Study. Optom Vis Sci 2004;81:298–307. Klein BE, Klein R, Lee KE, et al. Performance-based and self-assessed measures of visual function as related to history of falls, fractures and measured gait time. The Beaver Dam Eye Study. Ophthalmology 1998;105:160–4. Hawkins AS, Szlyk JP, Ardickas Z, et al. Comparison of contrast sensitivity, visual acuity and Humphrey visual field testing in patients with glaucoma. J Glaucoma 2003;12:134–8. Elliott DB, Hurst MA. Simple clinical techniques to evaluate visual function in patients with early cataracts. Optom Vis Sci 1990;67:822–5. Trobe JD, Beck RW, Moke PS, et al. Contrast sensitivity and other vision tests in the optic neuritis treatment trial. Am J Ophthalmol 1996;121:547–53. Yamane N, Miyata K, Samejima. et al Ocular higher-order aberrations and contrast sensitivity after conventional laser in situ keratomileusis. Invest Ophthalmol Vis Sci 2004;45:3986–90. Crossland MD. The role of contrast sensitivity measurement in patients with low vision. Optom Pract 2004;5:105–14. Latham KJC. Who uses contrast sensitivity in optometric practice? Ophthal Physiol Opt 1998;18:S2–13. Arditi A. Improving the design of the letter contrast sensitivity test. Invest Ophthalmol Vis Sci 2005;46:2225–9. Dougherty BE, Flom RE, Bullimore MA. An evaluation of the Mars letter contrast sensitivity test. Optom Vis Sci 2005;82:970–5. Haymes S, Roberts K, Cruess A, et al. The letter contrast sensitivity test: clinical evaluation of a new design. Invest Ophthalmol Vis Sci 2006;47:1–8. Elliott DB. Clinical procedures in primary eye care. Oxford: Butterworth-Heinemann, 1997. Elliott DB, Bullimore MA, Bailey IL. Improving the reliability of the Pelli-Robson contrast sensitivity. Clin Vis Sci 1991;6:471–5. Tabachnick BG, Fidell LS. Using multivariate statistics. Boston: Allyn & Bacon, 2001. Elliott DB, Sanderson K, Conkey A. The reliability of the Pelli-Robson contrast sensitivity chart. Ophthal Physiol Opt 1990;10:21–4. Elliott DB, Bullimore MA. Assessing the reliability, discriminative ability and validity of disability glare tests. Invest Ophthalmol Vis Sci 1993;34:108–19. Strasburger H, Wustenberg T, Jancke L. Calibrated LCD/TFT stimulus presentation for visual psychophysics in fMRI. J Neurosci Methods 2002;121:103–10. ↵i The Sloan letters are C, D, H, K, N, O, R, S, V and Z. ↵ii Mahalanobis distance is a measure of the correlation between individual variables that can be used to determine the presence of outliers. A point with high Mahalanobis distance has high leverage—that is, it has a greater influence on the coefficients of the regression equation than other points. To include these points would (1) violate the assumption of normality required for these analyses and (2) potentially introduce bias from one erroneous measurement. Parts of this work were presented at the Association for Research in Vision and Ophthalmology (ARVO) Annual Conference, Fort Lauderdale, Florida, 2 May 2006.